Bartlit Beck’s Chicago offices occupy four floors in the former Cook County Criminal Courthouse in the River North section of downtown Chicago. The Courthouse has a long history that serves as a good backdrop for Bartlit Beck’s trial focus. In the mid-nineteenth century, Bartlit Beck’s offices were the site of North Market Hall, a popular public market and meeting house. The Hall was destroyed in 1871 in the great Chicago Fire. After the fire, the site was acquired by Cook County for the construction of a new Criminal Courts building. Shortly after the new Courthouse was constructed, one of its most memorable trials took place. On May 19, 1875, after only 10 minutes of deliberation, a jury declared Abraham Lincoln’s widow, Mary Todd Lincoln, insane. The jury’s verdict read: “We, the undersigned jurors in the case of Mary Todd Lincoln, having heard the evidence in the case, are satisfied that said Mary Todd Lincoln is insane, and is a fit person to be sent to a state hospital for the insane.” Mrs. Lincoln spent four months in an insane asylum in Batavia, Illinois. In 1886, the Courthouse was the site of the Haymarket Square Riot Trial. In May 1886, police and protesters clashed in Haymarket Square in Chicago. A strike was in progress at Chicago’s McCormick reaper works, and several men had been shot by police during a riot at the plant. A meeting was called at Haymarket Square as a protest against police violence. The police attempted to disperse the meeting, and in the ensuing riot a bomb was thrown, triggering another gun battle. Seven policemen were killed and many other people were injured. Eight union leaders were tried and convicted for their role in the bloody union uprising. Four were put to death and one committed suicide. The Haymarket trial attracted huge crowds of outraged workers and sympathizers who packed the large amphitheater-styled courtroom designed with balcony seating and the idea that court proceedings were a form of public entertainment. In 1892, the original courthouse was torn down and replaced by the present building. It was the first “modern” courthouse in America. In response to the Haymarket experience, the new courthouse had smaller, pocket-sized courtrooms which made it easier to control crowds. In 1897, the Courthouse was the site of a well publicized trial involving Adolph Luetgert, whose wife had gone missing. The police suspected foul play, but her body could not be found. Mr. Luetgert had claimed his wife merely ran away to start a new life. Mr. Luetgert, who was known as the Sausage King for his North Side sausage factory, was convicted of murder and placing his wife’s remains in his sausage making machinery, an event that caused a marked decline in sausage consumption in Chicago. Throughout the 1920s, Al Capone was brought into the building for questioning concerning various crimes. But he was never brought to trial here. In another famous Courthouse trial in 1920, Shoeless Joe Jackson and seven other players from the Chicago White Sox were tried for throwing the 1919 World Series against the Cincinnati Reds. The White Sox (later nicknamed the Black Sox) players were all acquitted in the most famous scandal in baseball history. In 1921, Terrible Tommy O’Connor was tried and convicted of killing Chicago police officer Patrick “Paddy” O’Neil. He was sentenced to hang to death in the gallows constructed behind the Courthouse. Four days before his scheduled hanging, O’Connor escaped. The Judge ordered that the gallows that had been constructed within these walls specifically for his hanging be preserved in the hope that O’Connor would be recaptured. Tommy O’Conner was never captured, but the gallows remained standing for over 50 years, until 1977. In 1924, the building was the stage for the historic defense of “The Crime of the Century.” Nathan Leopold and Richard Loeb were charged with the murder of young Bobby Franks. The three gifted and wealthy teenage students lived in the Kenwood neighborhood on the south side of Chicago. Leopold and Loeb both had entered the University of Chicago at the age of 14 or 15, and Loeb is reported to be the youngest student ever to graduate from the University of Michigan. Leopold and Loeb thought they had pulled off the perfect crime. Once caught, they plead guilty to murder but still faced the death penalty. The families hired Clarence Darrow to represent the boys. Darrow made his eloquent and famous plea against capital punishment in a three-day closing argument. The young boys’ lives were spared. Loeb died in prison. In 1928, the Courthouse served as the bases for the play, and later movie, the Front Page. The play was based on the experiences of newspapermen Ben Hecht and Charles McArthur, who covered the Chicago crime scene from a small room reserved for reporters on the fourth floor of the building. Carl Sandburg also spent time in the fourth floor pressroom covering the trials. In 1929, the Criminal Courts vacated the building for larger quarters. In 1986, the building was restored to its present state. The building remains one of Chicago’s premier examples of the Romanesque Revival style, as interpreted by pioneer Chicago architect Otto Matz. 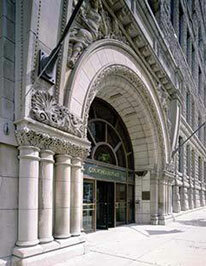 The building was designated a Chicago Landmark on June 9, 1993 and is on the National Register of Historic Places. The arched entry façade is carved with the figures of Truth and Justice, which remain the stock and trade of Bartlit Beck.